Although I wouldn’t exactly call myself a coffee junkie (I rarely drink it in the mornings & more often than not choose matcha lattes over ones with espresso), exploring different coffee shops around the city is undoubtedly one of my favourite things to do. This past weekend D and I visited one that had been on my radar for a while, and were pleasantly surprised by both the quality of the caffeine as well as the cafe’s delightfully rustic interior. Great thing to spend with. So as the georgeous bold mix and match. Agree with Natasha! The jacket! i love the leopard with the cobalt, such a cute mix! I am in love with the mix of colors in your outfit! Love the H&M top! Very cute outfit! i love your top and ypur jacket. they perfect together! Love the mix of colours and prints in this outfit! It looks so well put together, and everything manages to just GO with each other. The mix of the top, jacket, and bright blue jeans is awesome! And nothing beats a small, local coffee shop. did you go to the one with lucky doughnuts ?! Yes! Indulged in a French cruller as well. Deeeelicious! Fabulous, fabulous jacket. I love the block colors. It’s perfect with a pair of jeans! Lawrence and I walked past this place on Saturday night. We’ll have to return and sample the doughnuts. Great pictures! I love the mixing of prints and colors in your outfit! So cute! 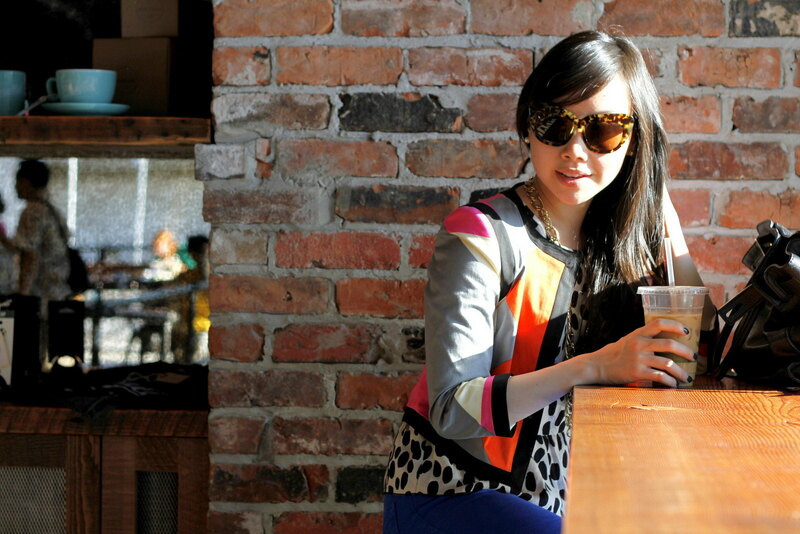 Love the different fashion blog backdrop with being inside a coffee shop. You look great! I just love your style, its so glamorously fab! Love the top. Got my eye on your blog now. You’re so colorful – I love it! Coffee is definitely one of my favorite things (I’ve become a little dependent on it lately…to much so…) and I love coffee shops, too! They’re always such cozy places with neat things and great places to read. um…that jacket is absolutely TDF!! Love it so much. Love the jacket! I’m not a big coffee drinker myself but enjoy the odd cappuccino or latte once in a while. 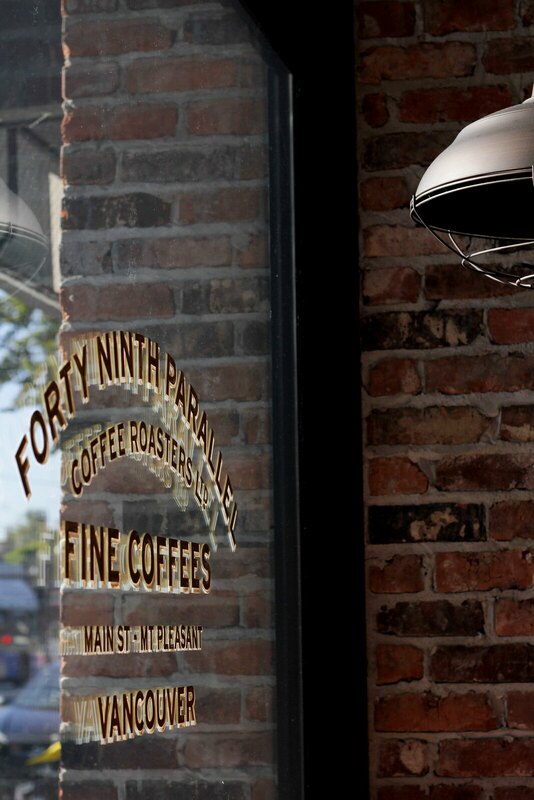 The light inside this coffee shop is gorgeous! Love this coffee break kind of shoot to show off your outfit and highlight your downtime enjoying an iced drink. I just LOVE that jacket, its perfection on you!